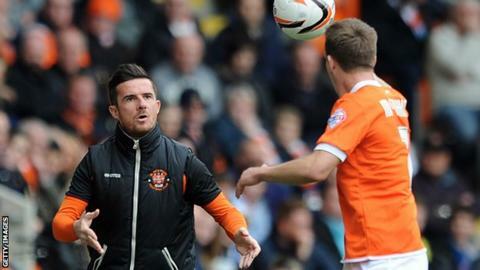 Barry Ferguson says his future at Blackpool is uncertain after guiding the club to Championship safety in a player-manager caretaker role. The 36-year-old took over at Bloomfield Road following Paul Ince's sacking. But the midfielder, who is set to have ankle surgery, may continue playing next season and accepts it might not be with the Tangerines if he does. "It probably won't be at Blackpool if I'm going to play on, but I'll make that decision mid-June," he said. Blackpool secured their Championship status despite a run of 17 league matches without a win. They were briefly top of the table after winning five of their opening six games under former manager Paul Ince. "There's no meetings planned with the chairman. I'm getting an operation soon on my ankle and I don't know whether I am going to play on yet." Blackpool, who were beaten 3-0 at home by Charlton in their final game, survived the drop with a backdrop of fan discontent with chairman Karl Oyston. But despite a difficult campaign Ferguson says the experience has given him a taste for management. "I want to be a manager, I've decided that," Ferguson said. "It's not scared me wanting to be a manager. I've loved it. I'm just thankful for Blackpool giving me the chance."